A long overdue prog rock masterpiece that showcases what Zucker is capable of when pulls it all together and throws in the kitchen sink. The sounds, music, and melodies that run through Zucker’s mind are amazing. 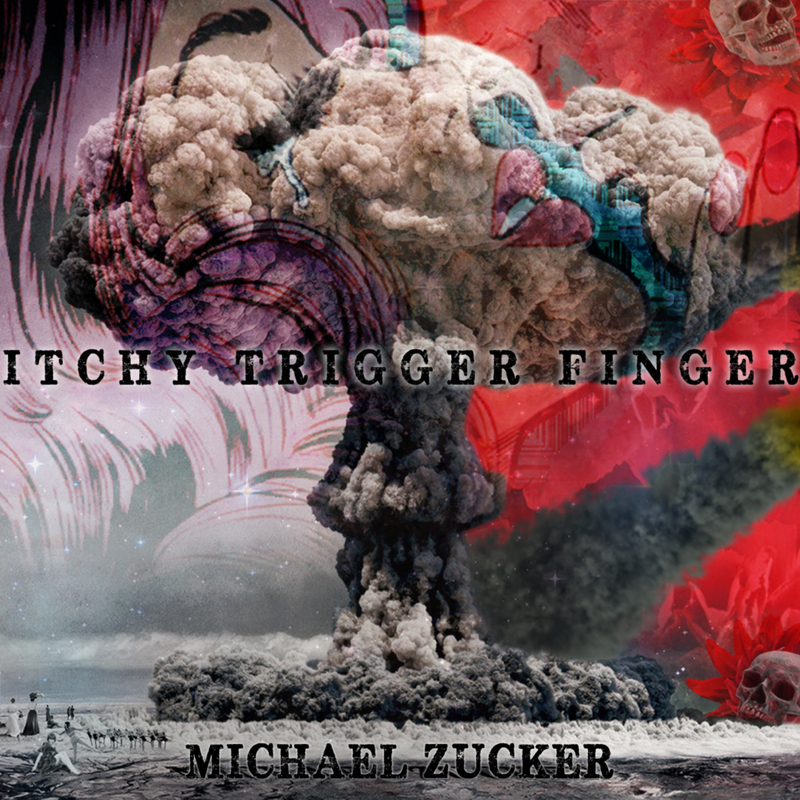 On Itchy Trigger Finger Zucker pulls the vast array of musical sounds that he’s harnessed over the years out of his musical arsenal and takes the listeners on a melodic journey. The symmetry of the album is particularly interesting in that the song titles are paired off almost as opposite ends of a spectrum; track 1 and 8, “Waking Shadows” feels like coming out of that dream state in the morning before your feet hit the ground and cognizance kicks in, “Sleeping Shadows” has more the feeling of the cacophony of noise in our heads at the end of the day before we drop into REM state. The songs build to crescendos and tactfully bring the listener back to earth. Track 2 and 7, “Icarus” (in Greek mythology, the son of Daedalus, the master craftsman) and Daedalus (the creator of The Labyrinth), the two songs together are numberless winding musical passages and turns that open into one another, seeming to have neither beginning nor end, no escape. Let us not forget that Daedalus built the labyrinth for King Minos, who needed it to imprison his wife's son the Minotaur. Track 3 and 6, “Incarnate” and “Reincarnate” are the life blood of the album, intricate melodies and sounds, taking on a life of their own. Riding into the maelstrom of sounds and back out again, a nice touch. Track 4 and 5, “Itchy Trigger Finger” and “Choke Artist” are two masterful pieces that play well off of each other. The song titles elude me, the album wasn’t made in haste, there is a lot of consideration given to each piece on the album, no trigger finger there. And as far as “Choke Artist”, failure is not a word I find to be synonymous with Zucker’s music, anything but, I’m always mesmerized by prolific song writers who consistently put music on the table for their listeners. Zucker really loosened up on this album creating great song structures, he showcases his guitar prowess. I love the way Zucker incorporated digital effects (chiptunes) into the album, keeping it to a minimum and not taking over the music. I’d be disappointed if there weren’t digital effects, a sound that has become synonymous with his music. The scratchy Disney sound bites add a nice ambience to two of the songs, a journey to the past and childhood revisited. The music on the album may not be for everyone, but for those who appreciate good music, lots of textures and support, and a musical odyssey, you’ll be pleasantly surprised.